This pack has five varieties of premium shrimp food for a comprehensive and nutritious diet for your shrimp. 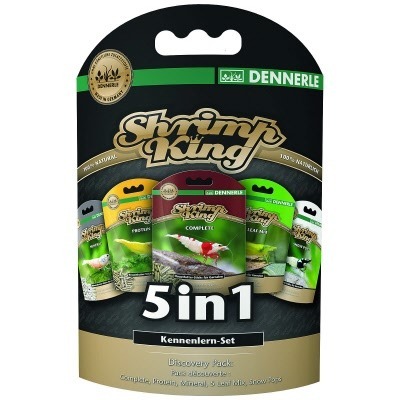 Dennerle Shrimp King's formula and shape are specially suited to the natural dietary needs of freshwater shrimp. Shrimp King food supplies all essential nutrients and substances for growth, vitamins, minerals, trace elements, and fiber. The professionals at Dennerle have carefully chosen nutritionally sensible and superior, food-grade, all-natural ingredients. Shrimp King food is free of artificial additives such as artificial colors, antioxidants, preservatives or attractants – guaranteed. This diet is also made without fish meal, fishery waste or poor-quality plant by-products as fillers.